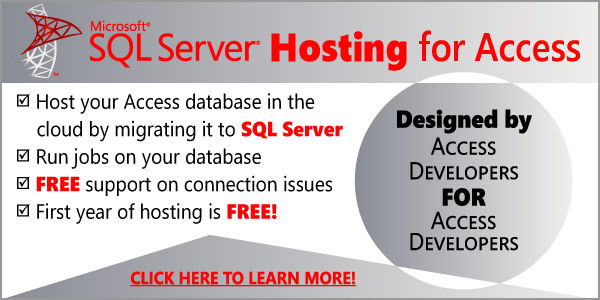 We LOVE using SQL Server with Access! I frequently mention that SQL Server Express was the best thing to happen for Access, the two combined have the best 1-2 punch in the industry. When converting Yes/No fields to SQL, use the Bit data type and set the default value to zero, (0). This means the default value will be false unless you set it to true in Access. Keep that in mind as you use the fields in Access. Create Indexes for foreign keys. Unlike Access, you must create your own indexes for primary keys coming from other tables. Always add a TimeStamp field to your tables. Otherwise you’ll start running into issues with multiple users and large amount of records. The timestamp field is a special field in SQL Server and it’s used by Access to determine when the record was last updated. Don’t use the field for anything in your forms, reports, code or queries, it will not work. Use Money field type when you need a field with decimal places and the precision needed is 4 or less decimal places. Your timestamp recommendation seems to be contradicted by http://technet.microsoft.com/en-us/library/cc917602.aspx. Admittedly this is an older article, but it is also talking about accessing SQL Server data over ODBC. The article on TechNet is not correct. Omitting the timestamp field will cause problems with editing data in Access. Tom, in addition the author also get basic fact wrong – In data type he lists “timestamp” (I prefer to call them rowversion) as equivalent to Access’ Date/Time when in fact the rowversion/timestamp data type are binary data type that does not even record date/time at all. Refer to this documentation @ http://msdn.microsoft.com/en-us/library/bb188204(v=sql.90).aspx where it explains that if a rowversion/timestamp is included in the query, Access will use it to reselect the row after an update and this is efficient in avoiding Write Conflict errors and/or #Deleted scenarios that may happen when you have different results (e.g. floating precision number data types, trigger modifying columns) than what Access originally submitted. Hope that additional details help.